The decision of the European Commission to require the Irish State to collect €13 billion in unpaid taxes, plus a potential €6 billion in interest, from US technology company Apple made headlines across the world. Special tax arrangements, which appear not to have applied the State’s already low 12.5% corporate tax rate, led to an effective tax rate on Apple of 0.05% in 2011 and 0.005% in 2014. Two tax rulings in 1991 and 2007 allowed an Irish company to book Apple sales across Europe, the Middle East, Africa and India in Ireland and attribute profit on these sales to a “head office” which was stateless, had no offices, had no employees and existed only on paper. The Irish State has decided to appeal the ruling, as has Apple itself. Apparently preventing the State from abjectly prostrating itself in front of Apple is an assault by the European Commission on the sovereignty of a small nation. It supposedly calls into question Irish tax policy while the Government frantically claims that the ruling affects the arrangements of no other multinational. The appeal is to protect Ireland’s reputation although being dragged kicking and screaming to apply your own laws without discrimination, while defending cheating other countries of tax revenue, is apparently good for it. The appeal is to prove that the Irish State is not a tax haven although a tax rate of 0.005% would appear to be a decent definition of one and defending it would appear to be open acknowledgement of it. The Irish Government seeks to defend its prerogative to set an (in)famous corporate tax rate of 12.5% but does so by defending a 0.005% rate. €13 billion is a big number and is the biggest judgement in the history of EU competition law – the cumulative total of all EU cases involving repayment of illegal state subsidies over the past 15 years is less than €11 billion – and it has been imposed on Apple, the world’s biggest company by market capitalisation. One explanation given for all this is that the Irish state is dominated by imperialism and plays its natural role as an obsequious supplicant to multinational capital. This is ok as far as it goes but it doesn’t go far enough, either in explaining or in providing the grounds for an alternative. If we start with the latter – an anti-imperialist struggle in Ireland to make the natural resources of Ireland the property of the Irish people isn’t a solution. For a start, the main natural resource of Ireland is its people. In fact the growth of technology, and companies like Apple, demonstrates that it is the knowledge and skills of workers which is the key to the most dynamic sectors of the economy. So it is harnessing the power of workers that is the key to economic development in Ireland as elsewhere, not minerals under the earth or the factory building which house the most modern production. The machines that power this production are obsolete within years; simple ownership of them does not guarantee the future unless workers not only own them but have the knowledge and capacity to continue to revolutionise their development. Secondly an utterly subordinate role for Irish capitalism does not explain how it allowed itself to become the vehicle for depriving other European countries of tax revenue, which the EU ruling now gives the latter an avenue to pursue. The ruling signals that although other EU states may not have liked the Irish State’s low corporate taxation regime, it was not such a problem if it remained relatively marginal. After all, they’re all engaged in tax competition in one form or another as one facet of inter-state and inter-company rivalry. The problem for the Irish is that they prostrate themselves disproportionately to the US, who don’t so much mind the role of Ireland as a tax haven since it is US tax rules which permit Ireland’s role of in tax avoidance and also still allows the US to take a cut if and when the profits are eventually repatriated, perhaps as a result of some tax amnesty. The Irish State has thus put itself in the middle of a bigger competition between EU and US capital and however much it might be “closer to Boston than Berlin” and wallow in its generations of emigrant’s ties to the old sod, the Irish State is part of the EU. Its facilitation of US companies through an effective tax haven can only be permitted so much success before the bureaucracy of the EU proto-state decided that it had gone too far. The Irish are therefore not just functioning as a subordinate client to imperialism but play a particular role in inter-imperialist rivalry. And it would be wrong to characterise this role as something anomalous to the normal functioning of capitalism. Apple had over $215 billion in cash and assets sitting outside the US as of June this year, sitting there avoiding US taxation. It has been estimated that this is only part of $1.4 trillion sitting offshore of the US, all avoiding tax and perhaps waiting for an amnesty and a nice big deal. It has been estimated that about half of all lending and deposits originate in Offshore Financial Centres(OFCs), about half of which are also tax havens. The Irish State comes in 9th on the list in terms of size of tax haven, behind the Cayman Islands, which is the largest, and Switzerland and the Netherlands, which are 7th and 8th respectively. These OFCs account for receipt of about 30% of the world’s foreign direct investment and themselves originate a similar amount. The EC ruling on Apple has been described as “a watershed” and liberal Irish commentators have argued that it’s a wake-up call – that the Irish State’s success, based on attracting multinationals through tax breaks, is not a strategy that will stand the test of time. The Irish State and its apologists claim that their tax policy is actually an industrial policy, which should be regarded as a purely national issue, but if this were so then we would expect the Cayman Islands, the Bahamas and Jersey to be thriving centres of industrial production. Their brass plate companies and those in Ireland shown how ridiculous this rebranding exercise really is. Some states benefit from tax competition and some suffer losses. The EU bureaucracy attempts to set rules that do not allow discrimination against European companies as if the European Union was one capitalist state, which it isn’t (yet). The state aid case against the Irish State is not therefore a bolt from the blue. Since 2000 there have been 400 state aid cases and 225 cases involving tax advantages across the EU. The Irish State, as a fully paid up member of the EU, has approved European Commission investigation of the tax arrangements of fellow EU states. In October last year the EC concluded that Luxembourg and the Netherlands had granted tax advantages to Fiat and Starbucks respectively and in January concluded the same in relation to Belgium’s treatment of at least 35 multinationals, mainly from the EU, amounting to €700 million that should be collected. The EC is currently investigating Luxembourg and its relations with Amazon and McDonald’s. Capitalist states therefore both cheat and enforce laws against cheating. They both protect big business and tax it in order to pay for itself. Mostly however they tax small businesses and workers to provide the services and infrastructure that allow society to operate and function, one that functions and operates according to the laws of capitalist accumulation. The vote in favour of the Austerity Treaty is clear. At 60 per cent Yes against 40 per cent No there is no room for doubt. It is a decisive endorsement of government policy and a mandate for further cuts and tax increases. The result should not have been unexpected given the political forces ranged in support of the Treaty, the support of big and small business, the failure of the trade union movement to oppose it and the inevitable support of the mass media. In the general election last year the Irish people voted by a large majority for a new government in no important way different from the previous one and with no claim to pursue significantly different policies. The result is nevertheless disappointing. Austerity isn’t popular despite the vote and never will be. Even the Yes campaign was under instructions not to celebrate its victory. Austerity is a reality because of an economic crisis which most people still believe was the fault of bankers and property developers. 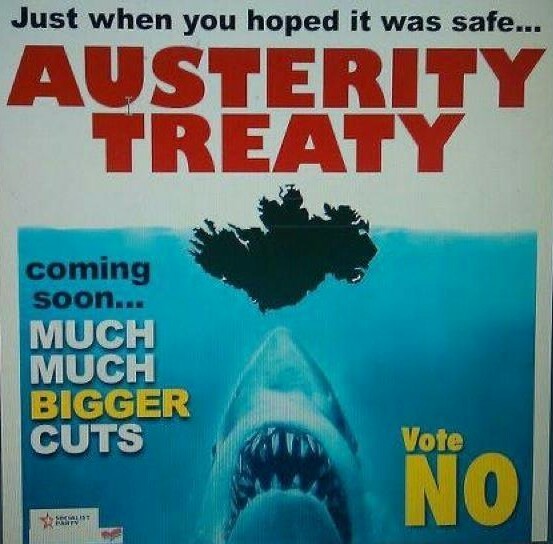 In October last year when the Austerity Treaty was originally being negotiated an opinion poll recorded 63 per cent opposed to it with only 37 per cent supporting. Quite simply many changed their minds. Why? Many voting Yes did so reluctantly while many will have wanted to vote No but didn’t vote or even voted Yes. The low turnout of 50 per cent reflected all this. Yet the vote was decisive. The No campaign was successful in challenging the failure of austerity and pointing out that such a policy across Europe would only lead to continued stagnation. Ironically it was more successful than it deserved to be because from a Marxist point of view it is by no means clear that austerity always and everywhere will fail, if by this we mean failure to return a particular economy to growth. Austerity, as the leaders of Germany understand it, is simply the state policy that enforces the normal disciplines of the market by cutting costs and devaluing capital so that the rate of profit is increased, accumulation of capital through investment and new business creation is encouraged and economic growth returns. Socialists oppose austerity not because it might or might not return the economic system to this position but because renewed growth rests on increased exploitation of the working class and posits continuation of a capitalist system that will accumulate and grow until the next crisis. Unfortunately we are not yet in a situation where the debate can be framed in terms of a choice of alternative systems but one which only asks the best way to help the existing one. The Keynesian alternative of increased government spending, summed up by the call for ‘growth’, has long captured the trade union movement and what passes for left politics. On the other hand there is ignorance of the alternative Marxist perspective and difficulty in arguing for it because of our weakness. We are also not agnostic as to which side of this capitalist debate wins. This means that excavating and pushing for a genuine alternative is not easy. The first lesson of the campaign however is that there has been a failure of the Keynesian alternative to convince, for it was predominantly under this banner that the No campaign was fought. Ironically one reason it failed is that, being no real alternative, it was so easily appropriated by the Yes campaign who blithely announced they were working on their own growth agenda. Being in government they are also the only ones in a position to do anything about it. Again the idea that the capitalist state should be called upon to solve a capitalist crisis is not one with which Marxists could agree. This is particularly true of the Irish state. Indeed the very idea that our notoriously venal and incompetent state, so implicated in facilitating the crisis, was itself the mechanism of salvation was obviously questionable. Even the odd interviewer could not resist pointing this out. Doubly ironic that this argument was employed by mainstream media figures in calling into question the claims of left wing No campaigners. In terms of the campaign therefore the criticisms of austerity were blunted by the governing parties’ claims that they too were working for a growth agenda. More importantly the need for austerity seemed inevitable because there is a huge debt, which is growing and it is going to have to be repaid. In the meantime the Yes side told us we needed to borrow to pay for state services and we needed to borrow from those states which are telling us to impose the Treaty. The latter would not take kindly to us saying no to their Treaty while asking for another loan. While the No side rejected the argument that we would be unable to borrow if the Treaty was rejected the Yes side countered by saying – why take the chance? If you heard once about needing a safety net you heard it a hundred times. It is widely accepted that the threat that the Irish State would not be able to borrow, or only at much higher rates, introduced the fear factor that triumphed. On this issue the weakness of the Irish state, faced with the EU and IMF, was exposed. The Irish people have had a couple of years to get accustomed to their subordination to the major European powers and decades of acceptance of subordinating policy to the needs of US multinationals. Any alternative based on the Irish State going in an alternative direction, one that questioned these arrangements, appeared implausible. The second lesson is very like the first. An alternative based on the Irish state challenging the big European powers or the IMF proved unconvincing because it lacks credibility. The campaign proved this. Blaming workers for being afraid when this is the real situation is therefore missing the target. The No campaign was always on the back foot. By saying it was not necessary to approve the Treaty for the State to borrow, when this borrowing has to be repaid, it simply reminded voters of the argument that austerity was necessary. Only two alternatives were weakly argued for in the No campaign. The first is that the debt should be defaulted on, simply not paid back. Secondly that the rich who caused the crisis or who have largely escaped its consequences should be taxed so that both these wrongs are righted. These arguments simply didn’t feature largely enough and I will look at just whether they are powerful and robust anyway in future posts. 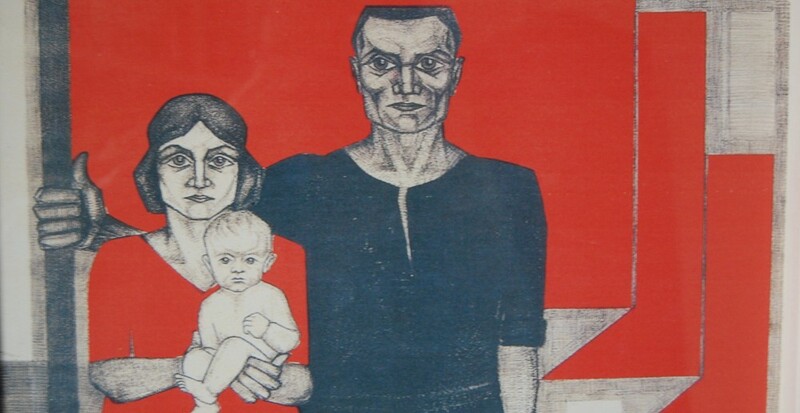 In the last analysis we have had a referendum on the consequences of a systematic crisis of the capitalist economy and the referendum has told us that unfortunately the working class does not yet have an alternative. This lesson is inescapable. Since the socialist alternative is the actions of the working class itself, if this class is too fearful to challenge the system then by definition no alternative currently exists. The Keynesian alternative that marked the No campaign proved unpersuasive. The capitalist alternative did not convince. At least on this score Marxists can be at one with the majority of workers. We can begin to exploit this agreement by putting our own criticism to counter the right and challenge the left that currently dominates what exists of a working class movement. We can also take heart that many workers, despite no real alternative being presented and being unable to begin creating one for themselves, still decided to either vote No or abstain. The No vote was overwhelmingly a working class one. The 20 per cent who voted No are not however anywhere near either a majority of workers nor of the majority of society on which a socialist alternative must rest. Nor can it be claimed that the 30 per cent who voted yes are middle class and can be ignored. What the media calls middle class is more often than not better paid workers who see themselves as having something to lose by challenging the status quo. If fear triumphed it is not because workers are congenitally cowardly. Fear is a rational response to relying on others for protection when these others – the governing parties, state bureaucracy and foreign institutions are all so wedded to austerity. Confidence on the other hand means confidence in ourselves and the alternative only we can create. It means to stop looking to others for answers, especially to parties that are committed to austerity, to a state that led us into the crisis and international bureaucracies that everywhere and at all times seek to impose austerity and protect the banks. Many workers took what action they could and protested by voting No. Protest is only the beginning of an alternative but it is a beginning.